Jelly Green is a contemporary British painter who divides her time between her studio in Suffolk and London. She has been mentored by international artist Maggi Hambling since she was 16 years old. Her work is inspired by the natural world where she embraces painting in the great outdoors whether the rainforests of Brazil, the iris fields of Cedric Morris’ Benton End or the woodland and forests of her native Suffolk. This is a new body of work inspired by some of our country’s greatest English Country gardens namely Great Dixter designed by the late Christopher Lloyd , Vita Sackville-West’s Sissinghurst , more local to East Anglia Beth Chatto’s garden and inspiration from gardens here in East Anglia. It is without doubt that Jelly is becoming an exciting new talent in the intenational art world and we are very priviliged to be showing her paintings in the setting of one of the country’s most historic Victorian country houses. Don’t miss this unique exhibition whether for pleasure, investment or appreciation of this extraordinary young artist . Jeremy Moulsdale was our best-selling sculptor at Glemham Hall in May 2018 . His sculpture is compatible with the beauty and gentle planting in Somerleyton’s white garden and we are delighted to have a large body of his affordable work to exhibit outdoors. Imaginative Traveller are delighted to be sponsoring Art For Cure at Somerleryton Hall. They have been creating inspirational adventure holidays for nearly 40 years. Based in Debenham in the heart of Suffolk we offer both small group adventures and create independent tailor made experiences. This allows a unique choice of travel styles to explore the world through small group adventures or bespoke experiences and offer over 500 different tours all over the world. Imaginative Traveller offer all sorts of themed tours from Cycling, Sailing, Walking and Trekking to Food and Wine or Wildlife and offer destinations as varied as Antarctica to Zambia or Alaska to Zimbabwe. With sister company, Dragoman, one of the longest established overlanding specialists in the world, you can even head off in one of their iconic orange trucks off the beaten track to Latin America, Africa or follow the Silk Route through Asia. These wood cabins are clustered in the gardens of the former Fritton Hall which was famous for its lakeside garden. There are still magnificent flowering rhododendrons and specimen trees but also some open glades. Here we have an eclectic mix of vintage and brand new, two, three and four bedroom woodland and lakeside cabins. This contemporary B&B with south-facing garden is less than 1 mile from Fritton Lake. The unfussy, airy rooms include free WiFi, iPod docks, flat- screen TVs and en suite bathrooms. They are all on the ground floor with hard floors and have direct access to the garden with views of Fritton Lake Country Park. Cooked breakfast is included and served in the breakfast room. A stylish boutique hotel in the heart of the Broads. The Hoste Arms, dates back 400 years. There are also restaurants, a sheltered walled garden, fitness centre, Beauty Spa and luxury 20-seat cinema. The Hoste was recognised as one of the leading ‘cool hotels’ by The Times in 2017 as well as one of the top 25 best food destinations in the UK. Standing at the gateway to Holkham Hall and park, 'The Victoria is close to Holkham beach and National Nature Reserve and is the perfect base for discovering the windswept coastline, seaside towns and villages on the north Norfolk coast. Perched on the cliff tops of the beautiful North Norfolk coast, you will find an elegant Edwardian mansion steeped in history. 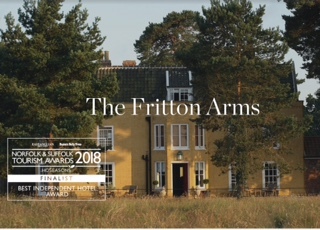 This fine Grade II listed building, resplendent in 5 acres of terraced gardens is the ideal location from which you can discover the unique diversity of both coast and countryside.Perched on the cliff tops of the beautiful North Norfolk coast, you will find an elegant Edwardian mansion steeped in history. This fine Grade II listed building, resplendent in 5 acres of terraced gardens is the ideal location from which you can discover the unique diversity of both coast and countryside. Located in the heart of the peaceful North West Norfolk coastline near to Hunstanton, The Briarfields at Titchwell is a hidden gem. Pull off the A149 coastal road and enjoy our tranquil setting and warm welcome. Situated between RSPB Titchwell and Royal West Norfolk Golf course, both overlooking the beach at Brancaster, Briarfields offers peace and relaxation or as much outdoor activity as you choose.